The actual stitching-together of the photos is the easiest part: just a few clicks and then some time spent watching the program think while it does the hard work. I first tried using the Panorama feature in the free program Windows Live Photo Gallery, and the results were quick and quite good for most of my experiments. All you have to do is select the photos you want to put together, click on Create and then Panorama, and then admire the results. Then I tried Photomerge Panorama in Photoshop Elements, which offers several automatic options for merging images, as well as the ability to manually place a series of pictures in a way that you think looks best. I opened the files I wanted to join, clicked on New and then Panorama Photomerge, chose one of the merge options, asked it to work with the open files, and then waited for the result. It took a bit more time, thought, and clicking – and the reading of tutorial or two – but the end result was practically identical for most image sets. So, for most simple panorama shots, either program is fine. I found that Photoshop is much better at joining sets of images that have very little overlap, though. When I gave Photo Gallery four images that didn’t easily merge, it just ignored two of them, while Photoshop gave me the option of placing those two leftover images myself and then did the best it could to link them. Whatever program you use, it’s only as good as the images you give it to work with. So really, creating great panoramic shots starts out in the garden. Basically, you stand in one spot, hold the camera as level as possible, and then turn slowly, taking a number of overlapping pictures. It’s best if you use a tripod, but that’s one thing that I’ve never had much patience with. After I figured this all out through trial and error, I ran across a blog post that does a good job explaining how to capture sets of images for making panoramic pictures, at How-To Geek: How To Make an Incredibly Easy Panoramic Photograph With Any Camera. There are also some excellent tips in the comments section of that post, so it’s worth reading the whole thing. For me, the hardest part of the project was finding the image sets that I’d shot over the last few months. Though I had tagged all of the images with plant IDs before archiving them, I had to open and scan every folder from the last few months to find the groups of images that I’d taken specifically for this project. As I found them, I gave them a “panorama” tag. I also went through some older folders to find panorama-like series that I’d taken by chance over the years. 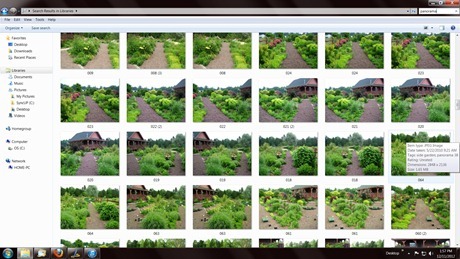 When I was done, I copied all of my panorama-tagged photos into one folder. That way, when I was in either Photo Gallery or Photoshop Elements, I could just open that one folder, with the images sorted by date, and easily find sets of images to work with. The front garden, looking back to the house. Some shots of the evolution of and seasonal changes in the side garden, taken from the side gate. By the way, if you look closely at the last one, you’ll see my most recent garden project: a path of log sections from some old silver maples that keeled over at the farm during Hurricane Sandy. My favorite bit is the center detail. I loved these curled sections and played around with a bunch of configurations before I settled on slipping one into the other. Ok, back to the panoramas. 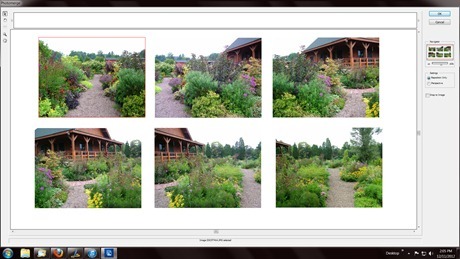 This one is of the perennial meadows (left) and veg garden (right). Two other tips: First, it’s tempting to shoot images over an arc of 180°, or even all the way around 360°, and use all of those pictures in one panorama, but I found that trying to make visual sense of the finished image took a good bit of effort, maybe because the proportion or perspective gets so distorted. Panoramas of 90° to 120° seem to be much easier to look at – but maybe that’s just me. Photoshop offers to fill them in for you, but I found that the results often looked odd, so I turned off that option. Cropping to straighten the edges does lose some of the image, but the final product looks much nicer, I think. Have fun if you decide to give this a try – and thanks for the inspiration, Alan! Another inspiring entry. That’s a great idea for those travel visits to gardens. Perhaps it can help relive the total experiences. Thanks for more food for a gardener’s mind. Hey, I hadn’t even thought of that. Thank you, Nancy! Your garden is so BIG and beautiful no matter how we see it. This is a good idea. I can’t wait to see all the gardens in panorama that this post inspires. Hi Lisa! If I had known how easy it is to do this, I’d have tried it a long time ago. I too hope that others will be tempted to give this a try. Great description and images illustrating this article. It is nice to see the design and evolution of your garden at this broader level. I’m so glad you found it of interest, pbmgarden. It’s a terrific tool for tracking changes over the years, and through the seasons. I try to take at least one set of photos for a panorama whenever I visit any place I really like — garden, natural spot, etc. Another free tool is the OpenSource “Hugin” stitching software. It’s got zillions of controls and seems daunting, but if you use the “wizard” and just click the buttons in order 1, 2, 3 it’s quite simple. I also have a non-free ($1.99) app on my iPhone called “AutoStitch Panorama”. It’s great for four reasons: 1) it can stitch photos together that are out of order 2) it stitches horizontally and vertically (at the same time) 3) there are *no* controls to figure out 4) I almost always have it with me. Hey, Alan! Thanks so much for the inspiration, and for the extra information on programs that will work for this technique. It’s funny you should mention the bird’s-eye view, because I was thinking about just that when I had to be up doing a bit of roof repair last month. Maybe I’ll try that next summer. Love the intertwined wood, great recycle project. Looks like you had to dig quite a bit to get them flat, hope your back and wrist are OK! I have a favorite picture, Aug 2008, looks like it was taken close to supper when the air gets that beautiful blue tinge to it. Hey there, Sue. It did take a good bit of digging to get those log rounds settled. 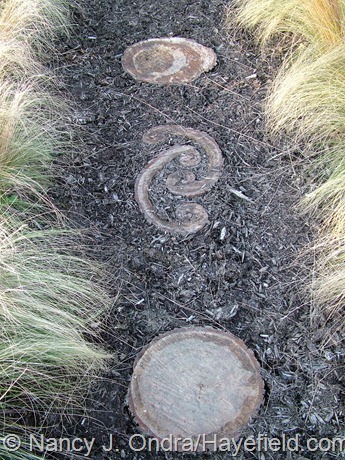 Though I like the look of the path, I’ve found that it’s not that pleasant to walk on, since the hard, solid wood is such a contrast underfoot to the soft, springy bark mulch around it. Oh well! You have such beautiful gardens! Thanks so much for visiting and commenting, bentneedle! A very educational tutorial that will save me some time traveling along the learning curve. But even more inspiring is the 2002 photo view that gives me renewed hope. My progress is somewhere between your 2002 and 2004 garden. I’ve been planting all this fall with only stakes, markers, trimmed stalks an lot of pine straw to show for my efforts. A little vicarious progress is just what I needed. Thanks to you, Nan!!! Oh yes, I well remember the seasons of stakes and string and “sticks.” I really wish I’d had a digital camera from the beginning. Don’t forget to take lots of pictures now, so you can admire you progress a few years from now. Very cool and a great explanation of how to do it. 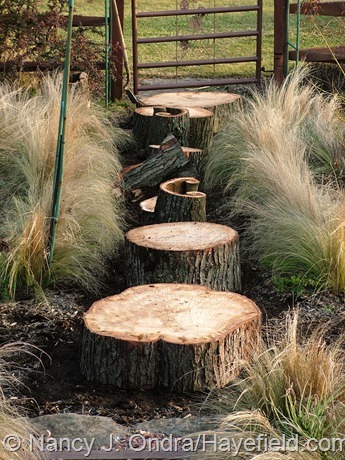 The log path is so creative. Something to remember for the future. I can imagine that the panorama technique would be fantastic for your place, Carolyn, especially in spring! Lots of good info here to practice with over winter. My garden is way too small for panorama shots but I can’t wait to try this out with botanical gardens. Wonderful to see the layout of your garden like this. Amazing work with the log sections — I can see those indoors or on a porch as a base for a small glass table. Oh, yes – there are so many possibilities for those log rounds. I wish I could have taken more of them, but even these were almost too heavy to move. Wonderful to get the perspective on your garden. Thanks for the wonderful post. Glad you enjoyed the new view, Carole! Your garden and your photos are exquisite! You are amazing!. You’re too kind, Ilene. Thanks for visiting! Even though the panoramas do differ from a roving human eye, I feel I have have a better feel for Hayefield in it’s entirety despite having viewed hundreds of images from your blog….Thanks for the experiment. The panoramas are a great tool both to communicate the experience of a garden, and to gain a broad perspective on one’s own space. I imagine it might be useful for garden design….especially to place important verticals (trees, shrubs, architecture structures or sculpture). 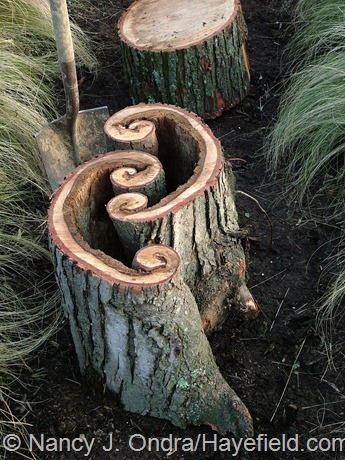 Those nested curli-Qs of the silver maple would indeed make a fabulous base for a glass table top……How long do you expect those stumps will last before rotting away, given your climate? Your guess is as good as mine, Eric. The rounds are so solid and thick that I’d think they’d be good for at least 10 years; maybe longer? And hey, thanks for the charming notecards you sent. You are very talented! I love the photos you created of your beautiful gardens. It puts everything into perspective – literately. I was inspired to download and try the Live Photo Gallery and it worked quite well. Thanks for the tips. I see loads of possibilities. Also, thank you for the seeds. I hope you have received the Verbascum olympicum I sent you. That’s great, Lorraine! Have fun with it. And yes, thanks so much for the mullein seeds! I was thinking about where I want to sow them when I was out doing garden cleanup this afternoon. What a great challenge! And we got a rare glimpse into your veggie gardens… one I think we don’t see enough of! I’ve been tempted to do a panoramic shot of my gardens, but sadly my front yard is so small I can get most of it if I just stand on my front porch. hehe! LOVED seeing the transformation of the yard through the years! I hope to see more panorama’s from you! Also, on the side: I got your seeds! This makes me blissfully happy. and then a little bit later… I got a special suprise letter?! My boyfriend called me your stalker… hahahaha. I think it’s true. Have a great time with the seeds, Donna. If you do eat the pretzel beans, let me know what you think! Wide view or Macro view…your garden is always fantastic! Merry Christmas from your garden friend in Houston, Texas. Thanks, David! I hope you’re having a wonderful and warm holiday. We’re supposed to have snow tonight! Another inspiring post Nan. Funny you should say your new path isn’t nice to walk on. I had the same experience with a similar project using embedded log rounds. 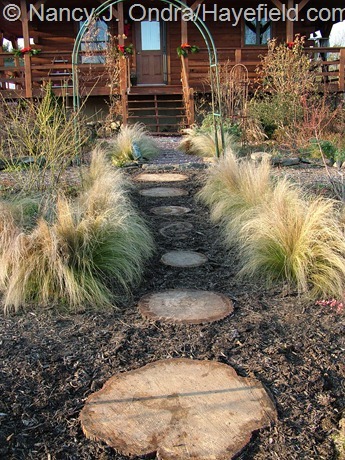 In the end I substituted small pebbles/gravel for the bark and the whole path became more solid to walk on and the edges of the logs were far less noticeable under foot. It wasn’t quite as woodsy looking but once the pebbles dirtied up a bit it looked almost as good as the original bark. Thanks for sharing that tip, Kerry. I’m hoping that adding more bark mulch around mine will help a bit, but that will have to wait until spring. I will say that the log rounds do provide a nice footing when the rest of the path is soggy-muddy.